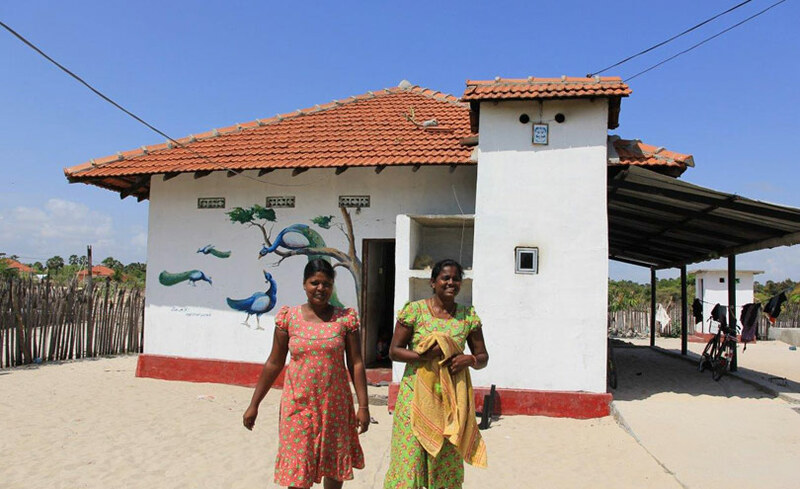 This project has provided humanitarian and financial support to help communities displaced as a result of the Sri Lankan civil war to rebuild their homes. The target is to fund and build 50,000 houses, for an estimated total of 225,000 people. The majority of the houses, 44,000 are self-build, 4,000 will be built by plantation workers, while only 1,000 are to be built by contractors. Following the prolonged civil war in Sri Lanka from 1983 to 2009, the Government of India took the decision to provide humanitarian and financial support to the Government and people of Sri Lanka to help them recover from the trauma of war. 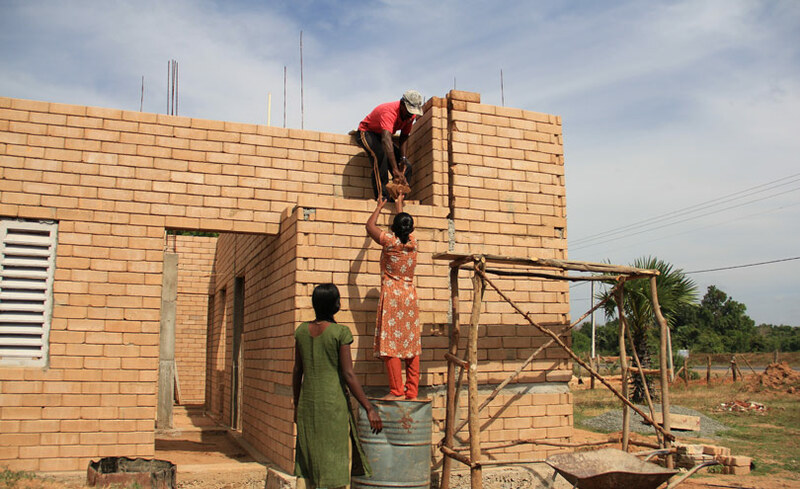 In total, the Government of India is supporting a number of self-help housing rehabilitation/development programmes costing over USD $240 million. Some of this funding is a grant, for example the funding for the 50,000 Houses of War Victims project, and some takes the form of long-term loan assistance. For this project financial assistance and organisational support has been provided to help internally displaced people to construct their own homes. The target is to fund and build 50,000 houses, for an estimated total of 225,000 people. The majority of the houses, 44,000 are self-build, 4,000 will be built by plantation workers. One thousand houses were constructed by commercial contractors before the owner driven approach was introduced as a more suitable solution. The focus on self-build is designed to give people a real say in their own housing solutions. The programme focuses on internally displaced people in dispersed, rural areas of Northern, Eastern, Central and Uva provinces of Sri Lanka. The basis of the programme is that people are enabled to return to land and property which they owned and lived in prior to the war. In effect, this means that some families are moving back to the area they left in 2009 or before. The houses that are developed are on average 550 ft2 in size, so relatively large compared to those often built as part of rehabilitation projects. The home owners are able to make decisions on the design, materials used, size of the house and whether they wish to add in their own savings or loans to include specific features or make the house larger. Since the construction work started in 2012, forty-five thousand, two hundred houses of the 50,000 target have been completed. 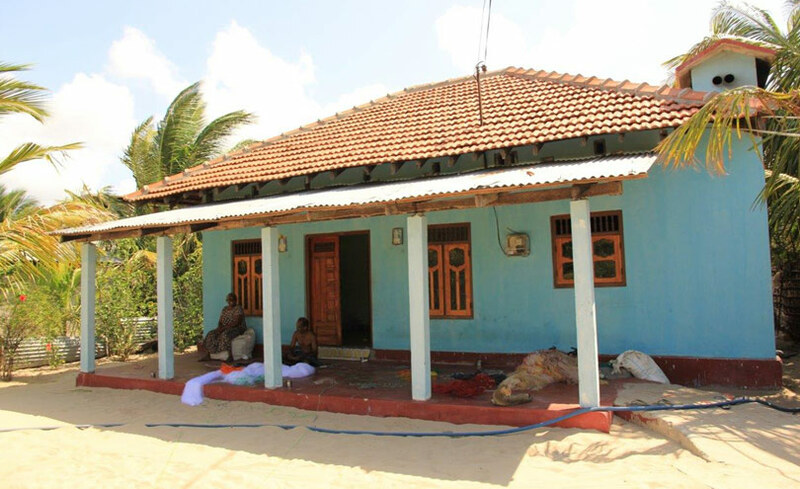 The houses are built on existing sites in villages or new sites provided by the Government of Sri Lanka. The main aim of the project is to deliver homes for internally displaced people in a quick and sustainable way. These people are the direct victims of the conflict: those who lost homes, property, assets, family members, livelihoods, income and social networks. The other beneficiaries are the plantation workers living in poor housing and environmental conditions for whom 4,000 houses are being constructed. rebuilding people, communities and social networks that suffered ruptured relations, shaken confidence, internal divisions and trust deficit and have seen much violence.The delivery of the phases beyond the house-building lie with the Sri Lankan government and the people of Sri Lanka but this project’s contribution is to develop a receptive climate for participative development action which supports future developments. The Sri Lankan civil war lasted 26 years and left large numbers of houses and public infrastructure damaged or destroyed. Around 160,000 houses were affected in the Northern Province alone. After such a long conflict, community life was shattered with networks and relationships broken down. The economy and governance structures were in crisis. 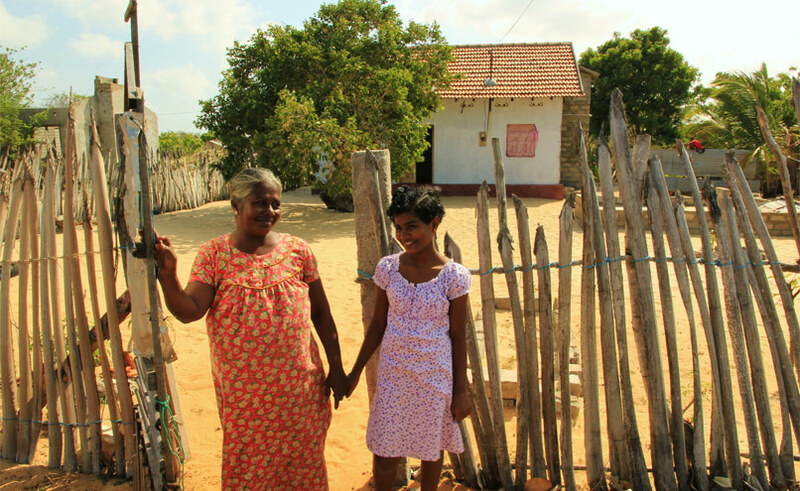 Displaced families returning to their places of origin were housed in temporary shelters, constructed by the Sri Lankan Government, humanitarian agencies or families themselves. Families survived with minimal security and scant protection from the elements. People were living in widely dispersed sites, many in forests with poor road connectivity, no electricity or other services. 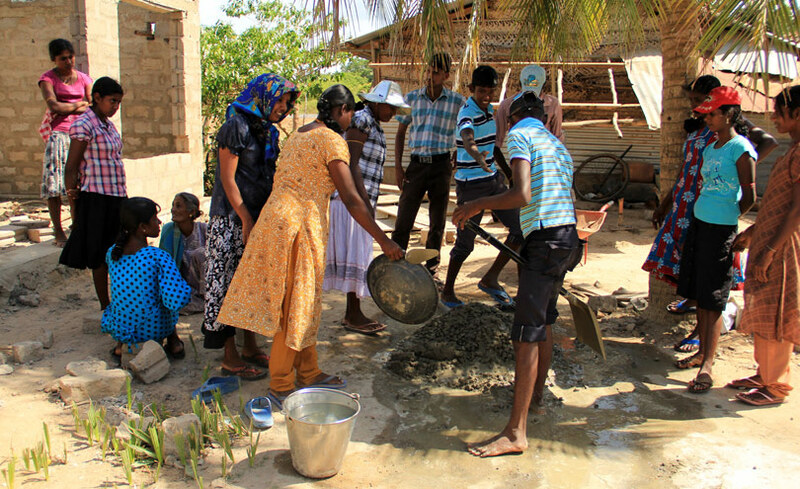 This project is working in the districts of Jaffna, Kilinochchi, Mullaithivu, Vavuniya and Mannar in the North and Batticaloa and Trincomalee districts in the East, which were areas of considerable conflict during the war and the most severely affected in terms of human and material losses: houses, physical and social infrastructure, transport, industry, commerce, business establishments, jobs and livelihoods were either destroyed or severely damaged. The focus on self-build housing changed the complexion of the reconstruction process and has planted seeds for people-led recovery. entrusting the delivery of the programme to people who are vulnerable (internally displaced people) and who had not recently had experience of being empowered to make decisions. This meant changing ways of working, setting aside apprehensions about shattered communities and discounting arguments that the families and communities would leave houses either incomplete or spend money elsewhere or construct poor housing. The role of the organisations supporting the implementation of the project was key in this regard as they were working with the communities at a local level. Empowering people with responsibility, decision making, money management and giving them a lead role in steering their own development process has enhanced their confidence and self-worth. The impact of this culture of self-help and dignity is demonstrated in the quality of houses built, their own financial contribution in enlarging houses and in the speed of construction as well as in the confidence they display in meeting other challenges. physical condition of the head of the family (wounded, disabled). Both the beneficiary selection and grievance redressal systems involved the entire community, as the approved lists were displayed in public places for everyone’s information and intervention. Debate and discussion around the list and the openness of the system to listen to every view and opinion made the process participatory and democratic. Besides officers of the Sri Lankan Government the four partner agencies, namely UN-Habitat, International Federation of Red Cross and Red Crescent Societies, Habitat for Humanity and National Housing Development Authority provide assistance in the identification and selection of the beneficiaries. The project wanted to serve the most severely affected people in the greatest of need. Transparent system for beneficiary selection. 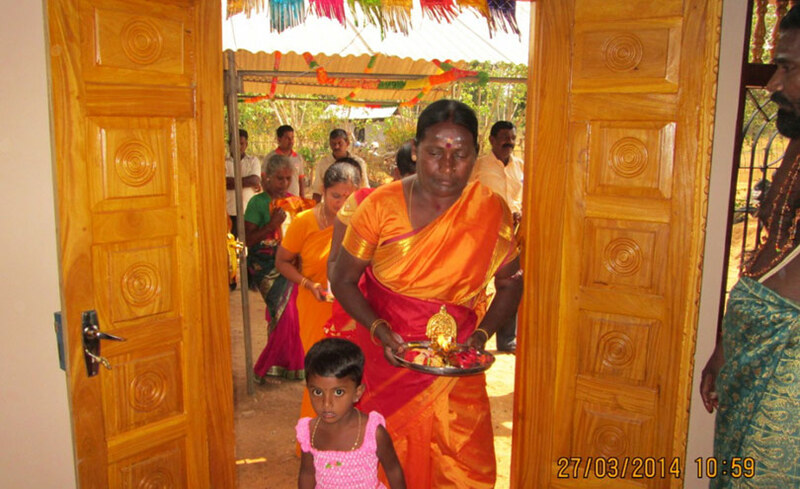 Re-settlement in the original village or new sites provided by the Government of Sri Lanka and approved by the community. Making available 15 – 20 prototype house designs to select from with required modifications for climate, local traditions and cost effectiveness. A house no smaller than 550 ft2. 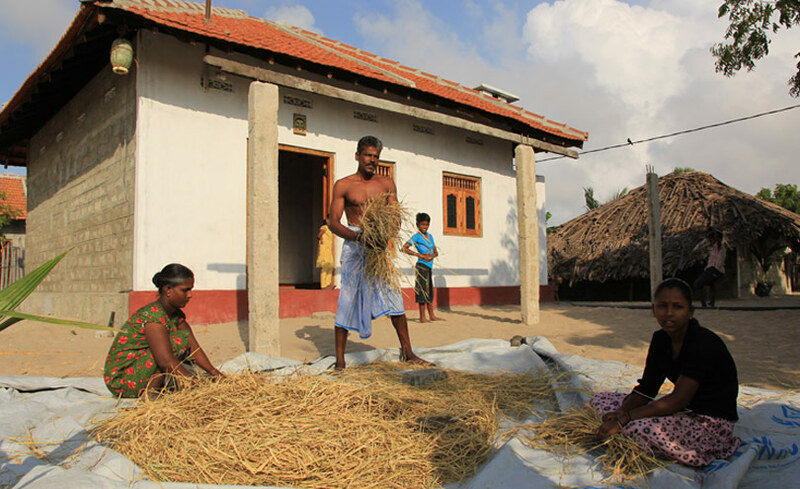 Grant of Sri Lankan Rupees (LKR) 550,000 (USD $3,800) per house towards construction costs. Payment in four installments at specific construction stages through electronic transfer. Facilitation through partner agencies for logistical support and technical assistance for speedy, cost effective and good quality construction via logistical support, technical guidance on construction, assistance in material procurement, quality, time and cost monitoring and account keeping. Physical infrastructure and social amenities provided by the Government of Sri Lanka. An effective grievance redressal system. The project is still being completed and therefore it is a little early to expect it to influence policy or institutional change. 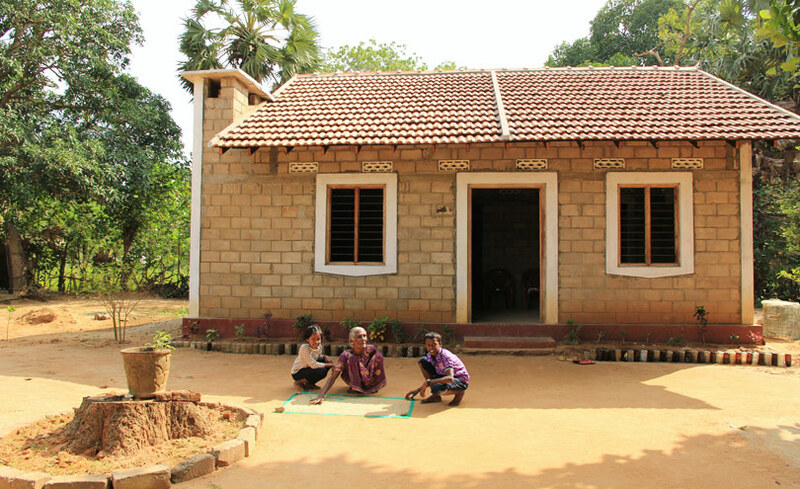 However, this model of facilitation by partner agencies has been presented to the Government of India as a way to improve owner participation and the quality of construction in the national housing programme for rural communities. 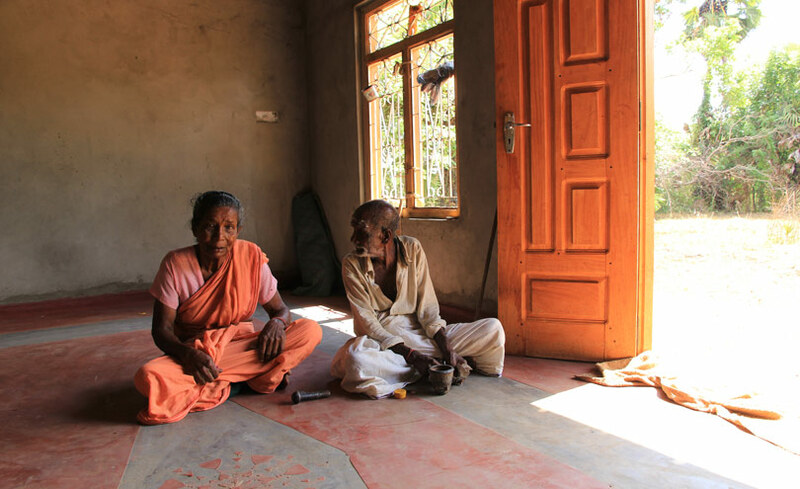 The project goes beyond accepting the conflict/disaster victim communities’ right to housing and rehabilitation. It provides housing and infrastructure and it provides houses that are better and bigger than the minimum size prescribed and does so in a manner that builds community capacity to meet other aspects of full recovery challenge now. The Government of India provided a grant of LKR 34.8 million (USD $240 million) for this project. Phase I for one thousand houses constructed by contractors at a cost of LKR 1.4 million (USD $10 million). Payment of fees to the four partner agencies. 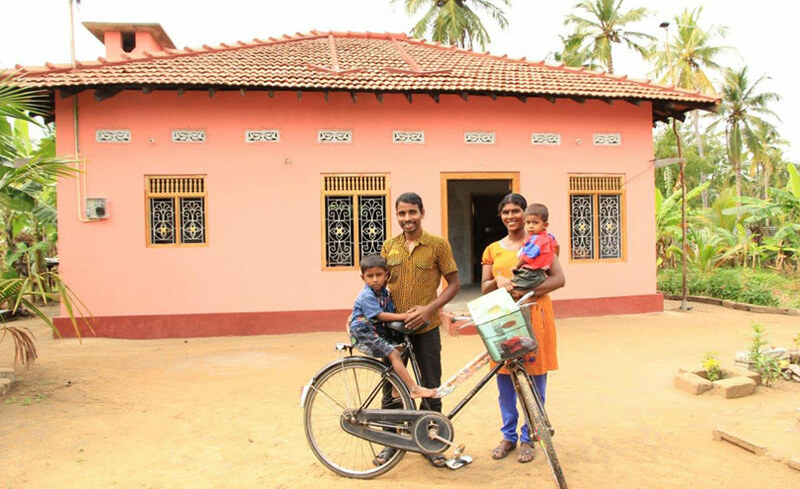 Payment to beneficiaries for construction of a house – Total of LKR 550,000 (USD $4,000) in four instalments, (LKR 100,000 = USD $700; LKR 200,000 = USD $1,400; LKR 200,000 = USD $1,400 and LKR 50,000 = USD $350). 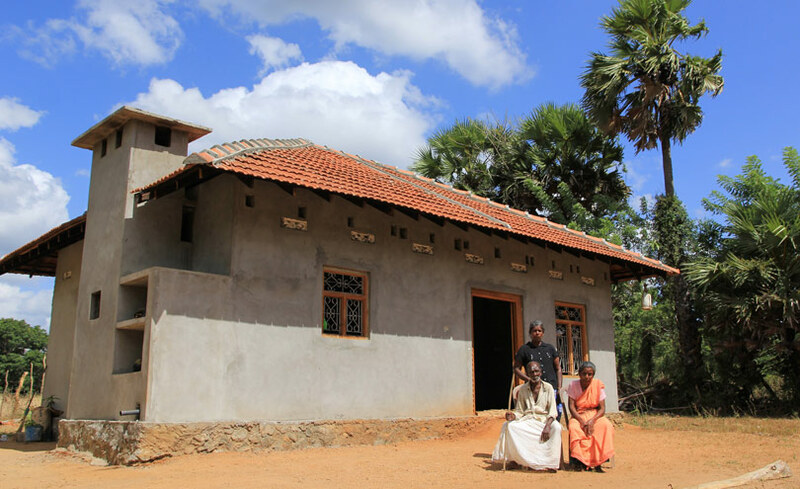 Payment to beneficiaries for repairs to houses – Total of LKR 250,000 (USD $1, 700) in three instalments (LKR 100,000 = USD $700; LKR 125,000 = USD $900 and LKR 25,000 = USD $200). The houses, both repaired and newly constructed, are ownership assets of the 50,000 families and so the costs of maintenance are the responsibility of the owners. The cost of maintenance of the physical and social infrastructure is borne by the Government of Sri Lanka through its departmental or development agencies. Self-build construction is not new in Sri Lanka. 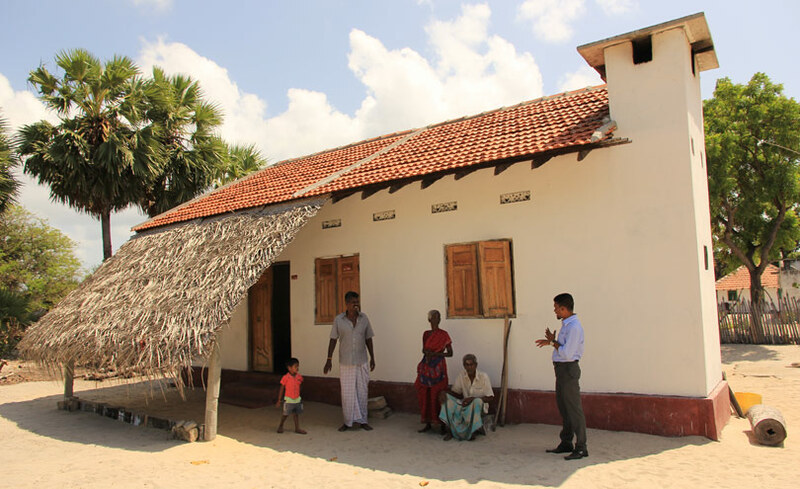 Houses had been constructed and projects had been implemented using that principle after the 2004 tsunami. What is new and an institutional innovation is the introduction of the partner agency as part of the organisational design for implementation. The facilitation role undertaken by the likes of UN-Habitat, International Federation of Red Cross and Red Crescent Societies, Habitat for Humanity and the National Housing Development Authority is new to Sri Lanka and the support and direction provided by these organisations has been key to the acceptance of the project by target communities and to the success of the project as a whole. Giving in kind, i.e. facilitation support rather than cash (benefitting families directly instead of Government to Government bilateral aid). Self-build on a large scale programme instead of engaging commercial contractors. Transfer of decision making responsibility to thousands of families. Institutional innovation: conceiving, identifying, hiring, deploying and supervising work and performance of four partner agencies as facilitators, while accepting self-help as a community tradition. The principle of “Building People and Communities while Building Houses” put the emphasis on the process as much as the product. A government programme entrusting decision making to communities challenges custom and practice. Investing in building a development platform while delivering a conventional service. Though a majority of the home builders have used conventional materials and techniques, some innovations have been introduced by the partner agencies. A visit was arranged to Kerala, Gujarat and Maharashtra in India for staff from partner agencies so that they could see innovative materials, projects and experiments. Fifteen engineers and supervisors participated and tried many options such as rat-trap bonds for masonry; filler slabs for roofs; twin-pit systems instead of conventional soak-pit methods for latrines and cement soil blocks in place of bricks were tried out on experimental basis. The choice of materials which are locally produced and available, usable by local craftsmen, easily repairable or replaceable, low cost and requiring low maintenance has been the main philosophy of the project. Home builders have been exposed to alternative materials, construction techniques and explained economic, environmental and social benefits. However, the project has not imposed any material or technique or technology on the home builders and the choice always remains with them. The structural design and detailing of the houses makes the structures disaster resilient, especially from cyclones and earthquakes. 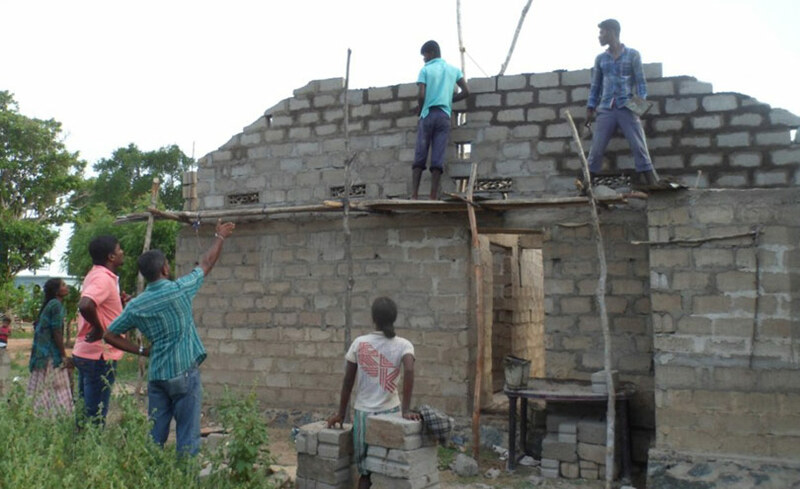 The participatory process of decision making and construction has raised people’s overall awareness of natural disasters and how to reduce impact (bracing walls against earthquakes and roof anchors to stop roofs blowing off during cyclones). The training of masons has also increased awareness and preparedness. In addition, some of the partner agencies have developed features which help improve the wider environment. UN-Habitat has raised special funds for tree planting and developed a community supported tree planting program in new settlements. In terms of overall housing need in providing 50,000 houses, this project has met a quarter of the needs of the Sri Lankan people. 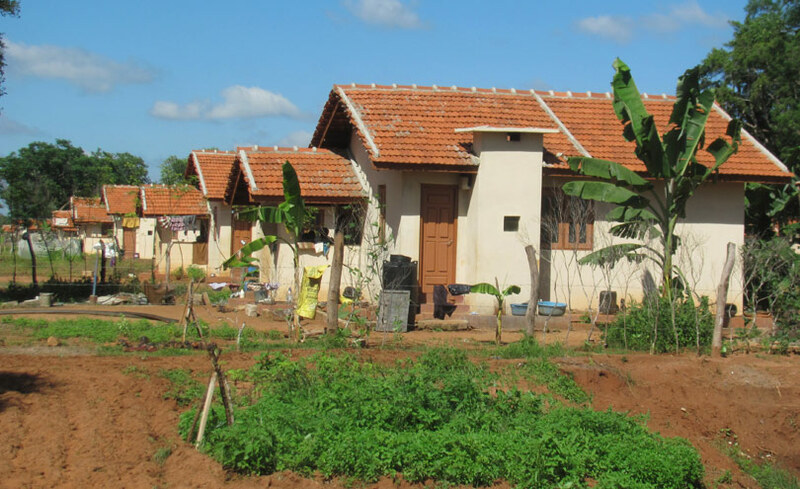 The additional housing required and also the subsequent phase of this programme (focused on economic development and wider infrastructure) will fall to the Government of Sri Lanka to fund. reasonable sized plots of land. The ‘owner-driven’ approach of this project has greater objectives than just the reduction in cost of construction through owner’s unskilled self-help labour contribution. The participatory/consultative approach is meant to see them as ‘owners’ and ’clients’ (as opposed to recipients of grants) and gives them decision making power. It has been noted that the system of self-build and decision making has not only improved the construction of the houses but has played a significant role in restoring people’s self-worth and cultivated a sense of dignity. Housing is the first and the key input in the long term and multi-faceted rehabilitation and recovery process for the individuals and the communities. In the area of physical rehabilitation and full scale recovery much remains to be done in terms of development of infrastructure – physical and social, for example, the restoration of livelihoods, creation of jobs and employment generation. It is in that context that the social capital built through a participatory house building process will be advantageous. Over a year long process of engagement in decision making, responsibility sharing, problem solving, conflict resolving, finance management, delivering and achieving has left a more determined, confident and responsible individual and citizen. lack of motivation for some and time constraint for others. activities to encourage motivation within the beneficiaries. flexibility in adaptation to the ground conditions. evidence of togetherness and collective community action. In addition, there have been no cost escalations and no major delays to the construction process. Discussions have started with local universities, NGOs, international development agencies and communities to undertake feedback studies on the impact of the owner-driven, self-help approach to construction. This is the first time that this project has been submitted for any award. However, the model has been acknowledged by the development partners in Sri Lanka including Diplomatic/UN Missions, INGOs and the Government of Sri Lanka. The model has already been adopted by the Indian government-owned Housing and Urban Development Corporation’s Committee on Rejuvenation and Strengthening of Building Centres Network, which is examining ways to revitalise the network of building centres in the country in order to support large-scale construction programmes. The approach of confidence building, motivating, initiative-taking and empowering the owners has been adopted for the 4,000 plantation workers’ houses, which are yet to be built. Beneficiaries and plantation companies have endorsed the approach. These houses were originally going to be constructed by contractors. The positive outcome of the project approach, both in the well-constructed houses and in human terms (i.e. 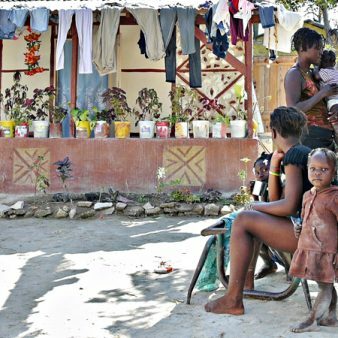 confident, self-respecting, initiative-taking communities) suggests the replication potential, not only in post-disaster reconstruction scenarios but also in normal circumstances where the clients are disadvantaged in some way.